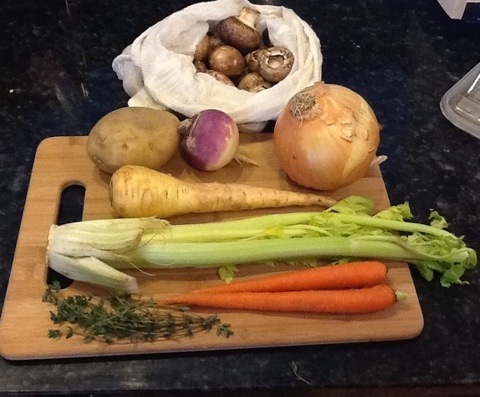 I’ve had several requests (ok, at least 2) for my pot roast recipe. Since I don’t use a recipe I’ll provide this how-to guide instead. Select vegetables that your family likes, or even ones they don’t like if the flavors would contribute to the overall taste of the pot roast. For example, no one else in my family cares much for onion or celery, but I consider them both essential to a pot roast. This is a good time to use the inner celery stalks with the leaves attached. If my celery gets too wilted to eat raw, I throw it in the freezer to use in pot roast, stocks and soups. (I almost typed souls, but I honestly don’t think celery does much for the soul.) Turnips are easy to hide because if you peel them, they look and taste like potatoes. Jewel and I love mushrooms in pot roast, and they lend an earthy depth to the flavor. I added fresh thyme this time because I had some on hand. 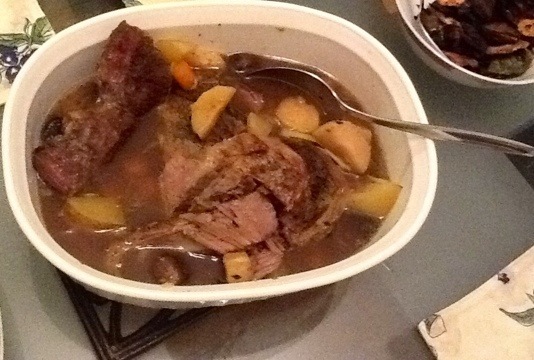 I cook pot roast in the slow cooker. This is usually a weekday meal for us. I start it before I leave for work and let it cook all day, 10-12 hours on low. I made this roast on Sunday, and since I put it in at 2 in the afternoon, I cooked it on high for 4 hours or so. 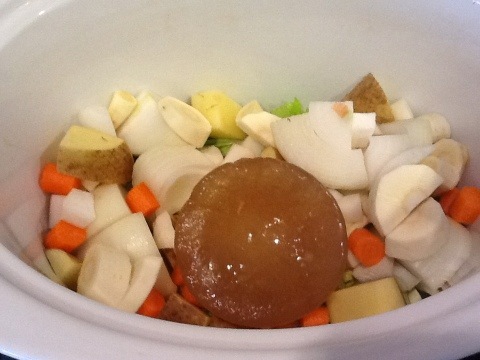 I placed the vegetables and the stock in the pot first before I browned the meat. I freeze leftover stock in small containers for later use. I used up the last batch of pot roast stock when I made Shepherd’s Pie, so I used the white stock (bone broth) I made earlier this month. You can get away with an inexpensive cut of beef for a pot roast. I often use chuck roast, and it turns out great. This time I used a sirloin tip roast because it was the only grass-fed roast available. Usually I would do an oven roast (roast beef) with this cut, but it made an excellent pot roast. 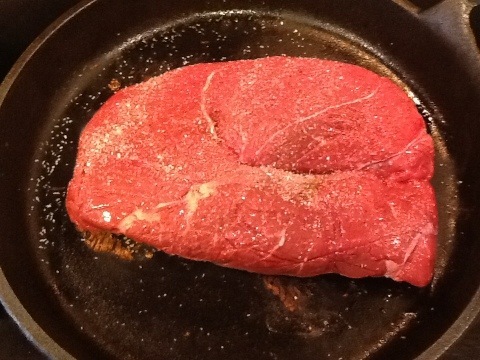 Sprinkle both sides of the meat with kosher salt and freshly ground pepper. I brown the meat on high heat before I place it in the slow cooker because I think it enhances the flavor. However, if you’re pressed for time, you can skip this step. If I feel particularly energetic I make little slits in the meat with a small knife and insert slivers of garlic. This time I just threw the garlic in with the vegetables. This is a meal the whole family likes. Dora even tried a parsnip and decided that she liked it! Emboldened by that discovery, she also tried a zucchini chip and liked that even better! In fact, she’s been asking me to make more zucchini chips ever since. Things are looking up. I made a pot roast today – onions, salt, pepper, thyme, and cabernet sauvignon. Yum. Sans wine, sweet potatoes are really good in a pot roast! Awesome! I forgot to mention that I added red wine as well. I’ll have to try sweet potatoes in a pot roast some time. It sounds good!